Western blot analysis of extracts from RAW 264.7 cells, untreated (-) or treated (+) with Lipopolysaccharide #14011 (LPS; 100 ng/ml, 7 hr), using CD40 (E2Z7J) Rabbit mAb (upper) and β-Actin (D6A8) Rabbit mAb #8457 (lower). Immunoprecipitation of CD40 protein from RAW 264.7 cells treated with Lipopolysaccharide #14011 (LPS; 100 ng/ml, 7 hr) cell extracts. Lane 1 is 10% input, lane 2 is Rabbit (DA1E) mAb IgG XP® Isotype Control #3900, and lane 3 is CD40 (E2Z7J) Rabbit mAb. 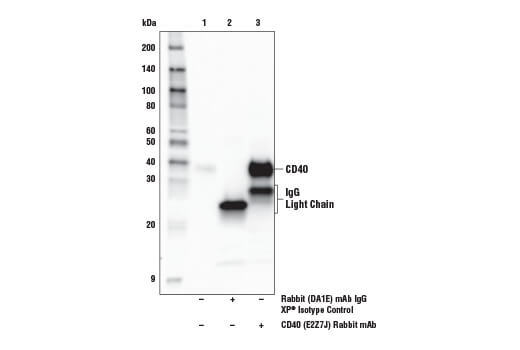 Western blot analysis was performed using CD40 (E2Z7J) Rabbit mAb. 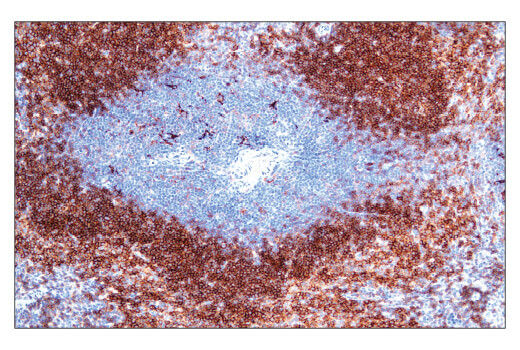 Immunohistochemical analysis of paraffin-embedded mouse spleen using CD40 (E2Z7J) Rabbit mAb performed on the Leica® BOND™ Rx. 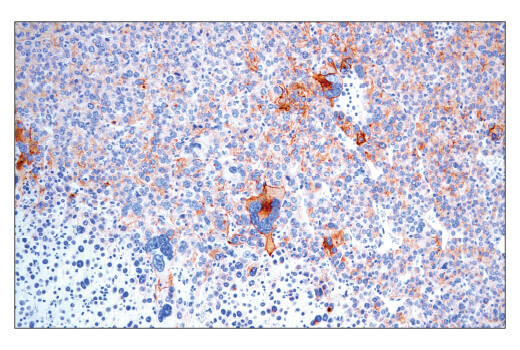 Immunohistochemical analysis of paraffin-embedded Renca syngeneic tumor using CD40 (E2Z7J) Rabbit mAb performed on the Leica® BOND™ Rx. 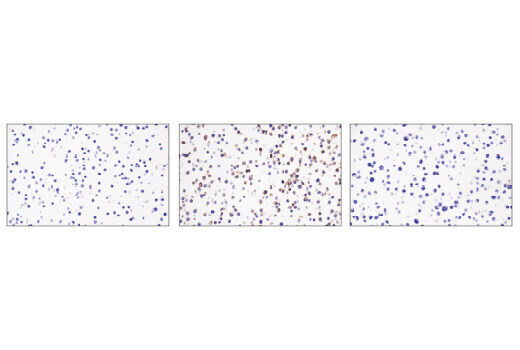 Immunohistochemical analysis of paraffin-embedded RAW 264.7 cell pellet, untreated (left, negative) or treated with Lipopolysaccharide (LPS) #14011 (middle, positive), and BaF3 cell pellet (right, negative) using CD40 (E2Z7J) Rabbit mAb. 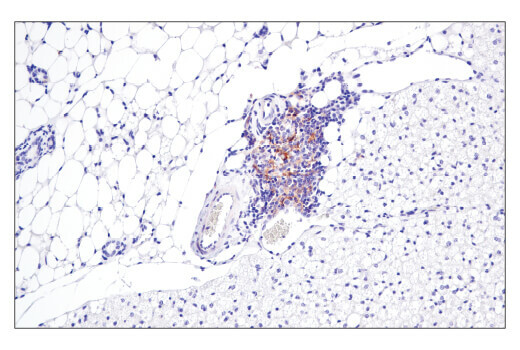 Immunohistochemical analysis of paraffin-embedded mouse adipose tissue using CD40 (E2Z7J) Rabbit mAb. Note staining of lymphoid cells and lack of staining in surrounding white and brown adipose tissues. 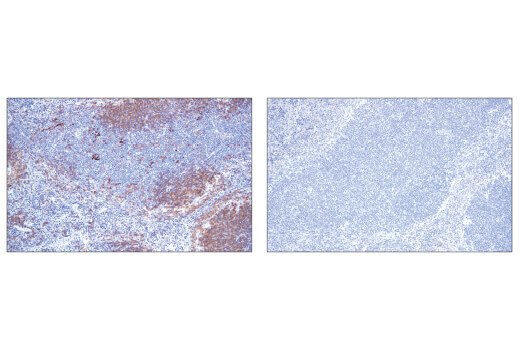 Immunohistochemical analysis of paraffin-embedded mouse spleen using CD40 (E2Z7J) Rabbit mAb (left) compared to concentration matched Rabbit (DA1E) mAb IgG XP® Isotype Control #3900 (right). CD40 (E2Z7J) Rabbit mAb recognizes endogenous levels of total mouse CD40 protein. 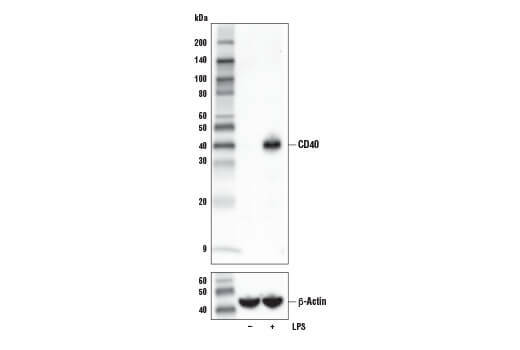 This antibody does not cross-react with human CD40 protein. Monoclonal antibody is produced by immunizing animals with a synthetic peptide corresponding to residues surrounding Val289 of mouse CD40 protein. CD40, also known as tumor necrosis factor receptor superfamily member 5 (TNFRSF5), is a type I transmembrane protein expressed on the surface of B cells and professional antigen-presenting cells of the immune system, as well as on several non-hematopoietic cell types and cancers (1-4). CD40 interacts with CD40 ligand (CD40L/TNFSF5), which is expressed primarily on activated T cells but has also been reported on blood platelets, mast cells, basophils, NK cells, and B cells (5). Upon engagement with CD40L, CD40 signals through TNF receptor associated factors and MAP kinase signaling pathways, resulting in a wide variety of immune and inflammatory responses, including dendritic cell activation and cross-presentation, T cell-dependent immunoglobulin class switching, memory B cell development, and germinal center formation (6-8). The CD40/CD40L axis is essential for the initiation and progression of cellular and humoral adaptive immunity, and is an important area of interest in the study of tumor immunology, neurodegenerative diseases, vascular diseases, and inflammatory disorders (9-12). Banchereau, J. et al. (1995) Adv Exp Med Biol 378, 79-83. Cooke, P.W. et al. (1999) J Pathol 188, 38-43. Hakkarainen, T. et al. (2003) Clin Cancer Res 9, 619-24. Slobodova, Z. et al. (2011) Neoplasma 58, 189-97. Gauchat, J.F. et al. (1993) FEBS Lett 315, 259-66. Quezada, S.A. et al. (2004) Annu Rev Immunol 22, 307-28. Spriggs, M.K. et al. (1992) J Exp Med 176, 1543-50. Elgueta, R. et al. (2009) Immunol Rev 229, 152-72. Korniluk, A. et al. (2014) Tumour Biol 35, 9447-57. Townsend, K.P. et al. (2005) Eur J Immunol 35, 901-10. Hassan, G.S. et al. (2012) Immunobiology 217, 521-32. Zhang, B. et al. (2013) Immunol Lett 153, 58-61.